Oliver Barnstable is the owner of Maine Adventure X-perience and Sunny’s boss. In a freak accident he has broken his leg. After surgery to repair the bad break he has ended up in a rehab facility. This makes Sunny’s life miserable, she not only has to run the office but make trips back and forth to the rehab center and cater to her bosses business needs as well. His roommate is no joy either, he is a hopeless flirt and a real pain. Then in the middle of the night Sunny gets a call from her boss saying his roommate was dead and he knows it wasn’t from nqatural causes. So now Sunny has a new assignment, find out who killed Gardner Scatterwell. I love the way Claire Donally writes. She gives the perfect voice to not only her human characters but to her feline ones as well. 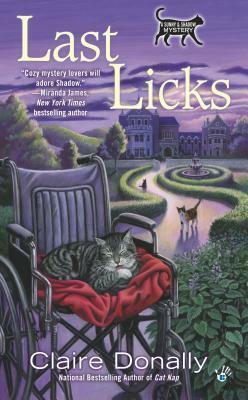 Last Licks takes us to a rehab center just outside of Kittery Harbor, Maine. In addition to a bunch of new human characters we meet the lovely female feline Portia, whose scent comes home on Sunny’s clothes and Shadow absolutely loves. Donally writing from the cats point of view is truly fun and unique. She has also crafted a great whodunit that had me confused and guessing until the very end. Again Shadow plays a very important part in solving the mystery. His person, Sunny, is just too inquisitive at times and ends up getting herself in trouble. Shadow seems to have kitty sense (like Spidey sense) to know just when to show up on the scene. This series is so much fun to read. If you have not read the The Big Kitty, start there and then move on to Cat Nap, and then Last Licks. You will absolutely love Shadow and Sunny too!! Claire Donally continues to be as much as a mystery as her books. This is a good book. I have read it. Review on Amazon.